Clear aligners (like Invisalign®) have changed the way we move teeth and offer an alternative option to braces. How do you know if it is right for you? 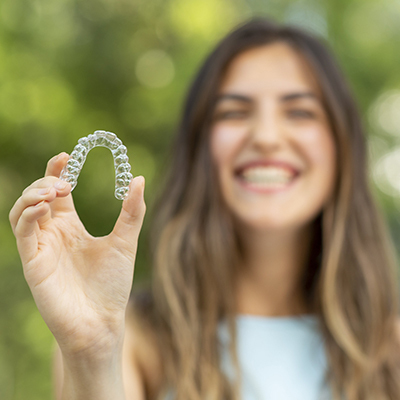 Here is some information on what to expect with your Invisalign treatment. In order for the teeth to move, the clear aligners need to be worn all the time for about 22 hours per day. They are only removed for eating and brushing your teeth. Typically, you will wear one set for one to two weeks, depending on Dr. Zach’s instructions, and then you will switch to the next one. Another major benefit is the aesthetics: Invisalign is clear! The aligners can grip on to your teeth by using clear, tooth-colored bumps or attachments. Everyone will need some bumps on their teeth to help get the desired movement to change your smile. One of the benefits of using clear aligners to straighten your teeth is they can be removed to eat. That means no eating restrictions! Any appliance that moves teeth will make them sore in the beginning. You should expect about three to seven days of discomfort when you start your treatment. As with braces, over-the-counter pain medication works to ease the discomfort.